Hypertensive disorders are the most common medical complication of pregnancy, affecting 6% to 8% of all pregnancies.1 Approximately 30% of hypertensive disorders in pregnancy are caused by chronic hypertension, and 70% are caused by gestational hypertension. The spectrum of disease ranges from mildly elevated blood pressures (BP) with minimal clinical significance to severe hypertension and multiorgan dysfunction. The incidence of disease is dependent on many different demographic parameters, including maternal age, race, and associated underlying medical conditions. Although geographic and racial differences in incidence have been reported, several risk factors have been identified as predisposing to the development of preeclampsia in different populations. For patients with a twin gestation, the incidence and severity are higher than in those with singleton pregnancy.2 In addition, the incidence is significantly higher in patients with previous preeclampsia and in those with previous preeclampsia remote from term.3 Patients older than age 35 years also have an increased incidence of preeclampsia, mainly because of increased undiagnosed chronic hypertension in this group of patients. Understanding the disease process and the impact of hypertensive disorders on pregnancy is of the utmost importance, because these disorders remain a major cause of maternal and perinatal morbidity and mortality worldwide. Making an appropriate diagnosis can at times be difficult in the gravid patient; however, adhering to the following definitions and classification schemes will help to eliminate confusion.1,4 Hypertension is defined as a systolic blood pressure of 140 mmHg or greater or a diastolic blood pressure of 90 mmHg or greater. These measurements must be present on at least two occasions at least 6 hours apart, but no more than 1 week apart.1 No longer in use are the criteria of increase in blood pressure above baseline measurements of 30 mmHg systolic, 15 mmHg diastolic, or 20 mmHg mean arterial pressure.1 It is important to note that choosing the appropriate size cuff will help to eliminate falsely lowered or elevated blood pressure measurements and render more accurate readings. Abnormal proteinuria in pregnancy is defined as the excretion of 300 mg or more of protein in 24 hours. The most accurate measurement of total urinary excretion of protein is through the use of a 24-hour urine collection. However, in certain instances the use of semiquantitative dipstick may be the only measurements available to assess urinary protein. A value of 2+ or greater correlates with 100 mg/dL. Proteinuria by dipstick is defined as the presence of protein of at least 1+ on at least two occasions at least 6 hours apart, but no more than 1 week apart.1 The accuracy of semiquantitative dipstick measurements on spot urine samples as compared with 24-hour urine collections is highly variable.5 Therefore, should time allow, a 24-hour urine collection for the measurement of urinary protein should be performed as part of the diagnostic criteria to define proteinuria. Care should be taken when obtaining urine protein measurements to use a clean sample as blood, vaginal secretions, and bacteria can increase the amount of protein in the urine. Edema is a common finding in the gravid patient, occurring in approximately 50% of women. Lower extremity edema is the most typical form of edema. Pathologic edema is seen in nondependent regions such as the face, hands, or lungs. Excessive, rapid weight gain of approximately 5 pounds per week is another sign of fluid retention. The current classification system of hypertension in pregnancy was originally proposed by the American College of Obstetricians and Gynecologists Committee on terminology in 1972. Further modifications by the National High Blood Pressure Education Program Working Group in 2000 arrived at the classification scheme used today, which offers simple, concise, and clinically relevant features for each of the four categories.1 This system recognizes four major categories of hypertension in pregnancy–gestational hypertension, preeclampsia/eclampsia, chronic hypertension, and chronic hypertension with superimposed preeclampsia. Gestational hypertension is defined as a blood pressure of at least 140 mmHg systolic and/or at least 90 mmHg diastolic on at least two occasions at least 6 hours apart after the 20th week of gestation in women known to be normotensive before pregnancy and before 20 weeks of gestation. The blood pressure recordings used to establish the diagnosis should be no more than 7 days apart.1 Gestational hypertension is considered severe if there is sustained elevations in systolic blood pressure to at least 160 mmHg and/or in diastolic blood pressure to at least 110 mmHg for at least 6 hours.4 Normalization of blood pressure will occur in the postpartum period, usually within 10 days. Gestational hypertension is the most frequent cause of hypertension during pregnancy. The rate ranges between 6% and 17% in healthy nulliparous women and between 2% and 4% in multiparous women.6,7,8,9 Some women with gestational hypertension will subsequently progress to preeclampsia. The rate of progression depends on gestational age at time of diagnosis; the rate reaches 50% when gestational hypertension develops before 30 weeks' gestation.10 Treatment of gestational hypertension is generally not warranted because most patients will have mild hypertension. Gestational hypertension in and of itself has little effect on maternal or perinatal morbidity or mortality. Women with gestational hypertension are likely to have elevated blood pressure with subsequent pregnancies and to have essential hypertension later in life. The rate of preeclampsia ranges between 2% and 7% in healthy nulliparous women.6,7 The rate is substantially higher in women with twin gestation (14%)11 and those with previous preeclampsia (18%).9 Preeclampsia is primarily defined as gestational hypertension plus proteinuria (300 mg/24 hours). If a 24-hour urine collection is not available, then proteinuria is defined as a concentration of 30mg/dL or more (≥1+ on dipstick) in at least two random urine samples collected at least 6 hours apart.1 The urine dipstick measurements used to establish proteinuria should be no more than 7 days apart.1 Preeclampsia may be further subdivided into mild and severe forms. The distinction between the two is made on the basis of the degree of hypertension, proteinuria, and the involvement of other organ systems. The criteria for mild preeclampsia and severe preeclampsia are presented in Table 1. In the absence of proteinuria, preeclampsia should be considered when gestational hypertension is associated with persistent cerebral symptoms, epigastric or right upper quadrant pain with nausea or vomiting, or in association with thrombocytopenia and abnormal liver enzymes. Close surveillance of patients with either mild or severe preeclampsia is warranted because either type may progress to fulminant disease. A particularly severe form of preeclampsia is the HELLP syndrome, which is an acronym for hemolysis (H), elevated liver enzymes (EL), and low platelet count (LP). This syndrome is manifest by laboratory findings consistent with hemolysis, elevated levels of liver function tests, and thrombocytopenia. The diagnosis may be deceptive because blood pressure measurements may be only marginally elevated. A patient with HELLP syndrome is automatically classified as having severe preeclampsia. Another severe form of preeclampsia is eclampsia, which is the occurrence of seizures not attributable to other causes. Hypertension complicating pregnancy is considered chronic if a patient has hypertension before pregnancy or if hypertension was present before 20 weeks' gestation or if it persists longer than 6 weeks after delivery. Women with chronic hypertension are at risk for superimposed preeclampsia. Superimposed preeclampsia is defined as an exacerbation of hypertension with the development of new-onset of proteinuria. Preeclampsia is a hypertensive disorder unique to human pregnancy. Several risk factors for the development of preeclampsia have been identified and are listed in Table 2. The risk to the fetus in patients with preeclampsia relates largely to the gestational age at delivery. Risk to the mother can be significant and includes the possible development of disseminated intravascular coagulation, intracranial hemorrhage, renal failure, retinal detachment, pulmonary edema, liver rupture, abruptio placentae, and death. Therefore, astute and experienced clinicians should be caring for women with preeclampsia. The etiology of preeclampsia remains unknown. During the past century, many theories regarding its etiology have been suggested, but most have not withstood the test of time. The syndrome is characterized by vasospasm, hemoconcentration, and ischemic changes in the placenta, kidney, liver, and brain.12 Reported abnormalities are summarized in Table 3.12,13,14 These abnormalities are usually seen in women with severe preeclampsia. Theories as to the causative mechanisms include placental origin, immunologic origin, and genetic predisposition among others. A great deal of research is dedicated to solving the etiologic enigma of preeclampsia. Without a definitive etiology, predicting patients at risk for the development of preeclampsia and effecting a treatment is difficult. The hypertensive changes seen in preeclampsia are attributed to intense vasospasm thought to be caused by increased vascular reactivity. The underlying mechanism responsible for the increased vascular reactivity is presumed to be alterations in the normal interactions of vasodilatory (prostacyclin, nitric oxide) and vasoconstrictive (thromboxane A2, endothelin) substances. Another vascular hallmark of preeclampsia is hemoconcentration. Patients with preeclampsia have lower intravascular volumes and have less tolerance for the blood loss associated with delivery. The most common hematologic abnormality in preeclampsia is thrombocytopenia (platelet count less than 100,000/mm3). The exact mechanism for thrombocytopenia is unknown. Another possible hematologic abnormality is microangiopathic hemolysis as seen in association with HELLP syndrome and can be diagnosed by schistocytes seen on peripheral smear and increased lactate dehydrogenase (LDH) levels. Interpretation of the baseline hematocrit level in a preeclamptic patient may be difficult. A low hematocrit level may signify hemolysis and a falsely high hematocrit may be caused by hemoconcentration. Vasospasm in preeclampsia leads to decreased renal perfusion and subsequent decreased “glomerular filtration rate” (GFR). In normal pregnancy the GFR is increased up to 50% above prepregnancy levels. Because of this, serum creatinine levels in preeclamptic patients rarely increase above normal pregnancy levels (.8 mg/dL). Close monitoring of urine output is necessary in patients with preeclampsia, because oliguria (defined as less than 500 cc/24 hours) may occur because of renal insufficiency. Rarely, profound renal insufficiency may lead to acute tubular necrosis. The pathognomonic renal lesion in preeclampsia is called glomerular capillary endotheliosis, which is swelling of the glomerular capillary endothelial and mesangial cells. Hepatic damage in association with preeclampsia can range from mildly elevated liver enzyme levels to subcapsular liver hematomas and hepatic ruptures. The latter are usually associated with HELLP syndrome. The pathologic liver lesions seen on autopsy are periportal hemorrhages, ischemic lesions, and fibrin deposition. Eclamptic convulsions are perhaps the most disturbing central nervous system (CNS) manifestation of preeclampsia and remain a major cause of maternal mortality in the third world. The exact etiology of eclampsia is unknown but is thought to be attributed to hypertensive encephalopathy and vasospasm with resultant ischemia or microhemorrhages and cerebral edema. Radiologic studies may show evidence of cerebral edema and hemorrhagic lesions, particularly in the posterior hemispheres, which may explain the visual disturbances seen in preeclampsia. Other CNS abnormalities include headaches and visual disturbances such as scotomata, photophobia, blurred vision, and, rarely, temporary blindness. The hallmark placental lesion in preeclampsia is acute atherosclerosis of the decidual arteries. This is caused in part by the abnormal adaptation of the spiral artery/cytotrophoblast interface and results in poor perfusion. This may lead to poor placental perfusion, resulting in oligohydramnios, intrauterine growth restriction, placental abruption fetal distress, and, ultimately, fetal demise. Given that nulliparity has a 5% to 7% risk of preeclampsia and multiparity has only a 3% risk, an accurate and thorough maternal history with identification of risk factors is the most cost-effective screening method available. SGA = Small for gestational age; N/R = not reported. *These rates are delivery <34 weeks. In contrast, perinatal mortality and morbidities rates and the rates of abruptio placentae are substantially increased in women with severe preeclampsia (see Table 4).16 The rate of neonatal complications is markedly increased in those with severe preeclampsia that develops in the second trimester, whereas it is minimal in those with severe preeclampsia beyond 35 weeks' gestation. Patients with preeclampsia should ideally be hospitalized at the time of diagnosis for evaluation of maternal and fetal conditions. A small percentage of these cases are associated with reduced uteroplacental blood flow. In addition, the mother is at slightly increased risk for the development of abruptio placentae or convulsions, particularly in cases remote from term. Thus, women with mild disease who have a favorable cervix at or near term should undergo induction of labor for delivery. The pregnancy should not continue past term (beyond 40 weeks' gestation), even if conditions for induction of labor are unfavorable, because the uteroplacental blood flow becomes suboptimal. There are numerous clinical reports (controlled and uncontrolled) describing the use of various drugs in an attempt to prolong gestation and improve perinatal outcome in women with mild preeclampsia remote from term. However, it is almost impossible to evaluate and to compare the results of these studies, because of the heterogeneous populations studied (all forms of hypertension), various parities, and absence of a control group in most of these studies. It is important to note that these drugs are used overseas and are rarely used in this country for this purpose. In addition, none of these studies has reported a better perinatal outcome than the respective outcome in studies using hospitalization alone. There are few controlled studies comparing the use of beta blockers versus either placebo or no treatment in the management of mild preeclampsia remote from term.20,21,22,23,24 Perinatal outcome derived from these studies is summarized in Table 5. Two of the six studies reported lower neonatal morbidity rates in the treatment group, and the other four reported no differences in perinatal outcome between treatment and control patients. However, all studies reported a lower incidence of progression to severe hypertension in the treatment group. Of note, the sample was not adequate in any study to evaluate perinatal mortality. In addition, none of these studies showed a better perinatal outcome compared with studies that included hospitalization only for management of mild preeclampsia. Recently, Sibai and colleagues25 (in a prospective, randomized trial) compared no therapy to the use of nifedipine in the management of mild preeclampsia remote from term. They found that nifedipine was effective in reducing maternal systolic and diastolic blood pressure in women with mild preeclampsia. However, this reduction in maternal blood pressure was not associated with a reduced number of antepartum hospital days in the nifedipine group. In addition, the use of nifedipine led to a lower incidence of delivery for severe hypertension (9%) as compared with the no therapy group (18%). However, such reduction in incidence of severe hypertension in the nifedipine group was not associated with a concomitant improved pregnancy prolongation when compared with the no therapy group. This was because of the fact that a larger percentage of patients in the nifedipine group (16%) were delivered for fetal reasons (abnormal antepartum testing and fetal growth retardation) as compared with the no therapy group (9%). Consequently, the two groups had similar gestational ages at the time of delivery and similar birth weights. In addition, the incidence of preterm births, SGA infants, and infants admitted to the special care nursery were similar in the two groups. 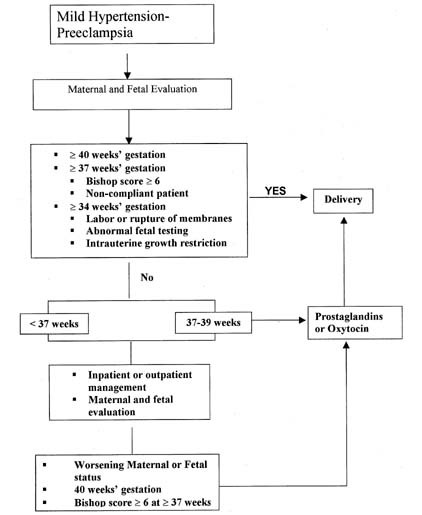 Our management plan at the University of Cincinnati for patients with mild preeclampsia is summarized in Figure 1. All patients with mild preeclampsia require maternal and fetal evaluation at the time of diagnosis. Subsequent management will depend on maternal and fetal findings as well as gestational age. If the patient has mild hypertension in the absence of significant proteinuria (<1000 mg in 24 hours) or maternal symptoms (headaches, visual disturbances, or epigastric pain), outpatient observation may be considered on a selective basis. This form of management is appropriate in a reliable patient only during the early stages of the disease and in the absence of fetal jeopardy (abnormal testing or abnormal fetal growth). These patients are instructed to have rest at home, daily urine dipstick measurements of proteinuria, and blood pressure monitoring (by self or by nurse). The patient is also instructed to keep fetal movement counts and to report any symptoms of impending eclampsia. The patient is then evaluated in the antepartum testing area for maternal and fetal well-being at least two times per week. If there is any evidence of disease progression and if acute severe hypertension or proteinuria develops, then prompt evaluation is indicated. If there are any signs of worsening maternal or fetal conditions at any time during outpatient management, then hospitalization or delivery is indicated. In addition, after 37 weeks' gestation, labor should be induced as soon as the cervix is favorable (Bishop score greater than 6). Fig. 1. Recommended management of mild gestational hypertension or preeclampsia. The clinical course of severe preeclampsia may be characterized in some patients by progressive deterioration in both maternal and fetal conditions. Pregnancies complicated by severe preeclampsia are associated with increased rates of perinatal mortality and increased risks of maternal morbidity and mortality. As a result, there is universal agreement that all such patients should be delivered if the disease develops after 34 weeks' gestation or before that time if there is evidence of maternal or fetal distress. There is also agreement on delivery of such patients before 35 weeks' gestation in the presence of any of the following: premature rupture of membranes, labor, or severe fetal growth retardation (less than fifth percentile for age). In this situation, appropriate management consists of parenteral medications to prevent convulsions, control of maternal blood pressure within a safe range, and then induction of labor to achieve delivery. If delivery of a preterm infant (less than 36 weeks' gestation) is anticipated at a level 1 or level 2 hospital, the mother should be transferred to a tertiary care center with adequate neonatal intensive facilities. There is considerable disagreement about management of patients with severe disease before 34 weeks' gestation. Some authors consider delivery as the definitive therapy for all cases, regardless of gestational age, whereas others recommend prolonging pregnancy in all severe preeclamptic gestations remote from term until either development of fetal lung maturity, fetal or maternal distress, or gestational age of 36 weeks is achieved. Some of the measures used in these cases have included one or more of the following: antihypertensive agents, diuretics, sedatives, chronic parenteral magnesium sulfate, plasma volume expanders, and antithrombotic agents. It is important to note that such measurement requires intensive monitoring of both maternal and fetal well-being on a daily basis. Unfortunately, these studies were retrospective and uncontrolled except for three recent studies described subsequently. 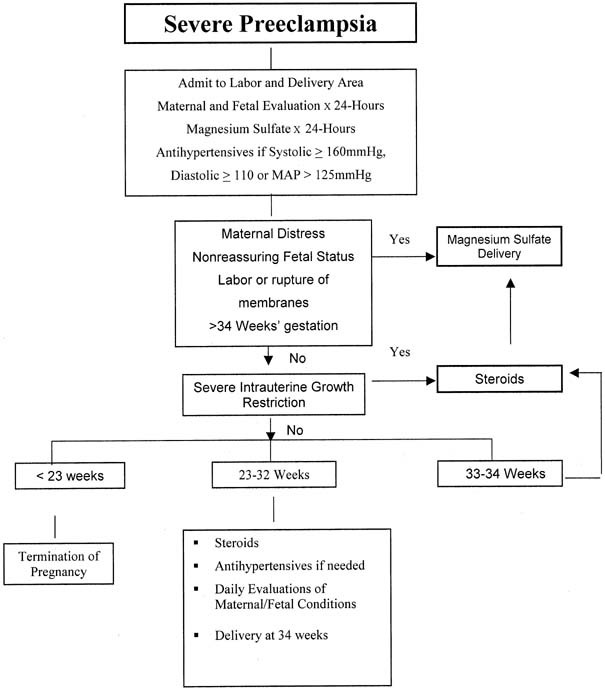 In the first recent study, the results of individualized management were reported in 58 women with severe preeclampsia at 28 to 34 weeks' gestation.26 These patients were treated initially with magnesium sulfate, hydrazine, and corticosteroids for fetal lung immaturity. All received intensive maternal and fetal evaluation in an obstetric ward for patients at high risk. Nonstress tests were performed at least three times daily and laboratory tests were evaluated at least twice weekly. Twenty of the 58 women were delivered because of maternal and/or fetal reasons within 48 hours after hospitalization. The remaining 38 were then randomized to either aggressive or expectant management (n = 20). Patients assigned to the aggressive management group received steroids and were delivered within 72 hours. Patients assigned to the expectant management group were treated with hydrazine to maintain blood pressure between 140/90 to 150/100 mmHg. In addition, they received frequent evaluation of maternal and fetal well-being. These patients were delivered at 34 weeks' gestation or before in the presence of maternal or fetal distress. The authors found fewer neonatal complications and fewer number of days spent in the neonatal intensive care unit in the expectant management group. Sibai and coworkers28 studied 95 women with severe preeclampsia at 28 to 32 weeks' gestation who were randomly assigned to either aggressive management (AM) (n = 46) or expectant management (EM) (n = 49). The two groups were similar at the time of randomization with respect to several clinical and laboratory findings. The average pregnancy prolongation in the EM group was 15.4 ± 6.6 days (range: 4–36 days), which was significantly higher than the average of 2.6 days in the AM group (p < .0001; range: 2–3days). Indications for delivery in the EM group were maternal reasons (n = 16), fetal compromise (n = 13), attainment of 34 weeks' gestation (n = 10), preterm labor or rupture of membranes (n = 7), or vaginal bleeding (n = 3). The maternal indications for delivery were thrombocytopenia (n = 5), uncontrolled severe hypertension (n = 3), headache/blurred vision (n = 3), epigastric pain (n = 2), severe ascites (n = 1), and maternal demand (n = 2). Table 6 compares the pregnancy outcomes in the two groups. Gestational age at delivery, placental weight, and birth weight were significantly higher in the EM group. The two cases of abruptio placentae in the AM group were found at time of cesarean section, whereas the two cases in the EM group were suspected because of abnormal fetal heart rate testing and vaginal bleeding. There were no cases of eclampsia, pulmonary edema, renal failure, or disseminated coagulopathy in either group. No fetal or neonatal deaths occurred in either group. The number of infants admitted to neonatal care unit (37% vs 46%), average duration of stay in that unit (20% vs 37%), the frequency of respiratory distress syndrome (22% vs 50%), and necrotizing enterocolitis (0% vs 11%) were significantly lower in the EM group. At the University of Cincinnati, patients with severe preeclampsia remote from term are admitted initially to the labor and delivery area for continuous evaluation of maternal and fetal conditions for at least 24 hours (Fig. 2). During observation, they receive continuous infusion of magnesium sulfate to prevent convulsions and IV doses of hydrazine (5 mg–10 mg) or oral nifedipine (10 mg) as needed to keep diastolic blood pressure below 110 mmHg. Maternal evaluation includes continuous monitoring of blood pressure, heart rate, urine output, cerebral status, and the presence of epigastric pain. Laboratory evaluation includes a platelet count and liver enzymes. Fetal evaluation includes continuous fetal heart monitoring, a biophysical profile, and ultrasonographic assessment of fetal growth. Patients with resistant severe hypertension or other signs of maternal or fetal deterioration are delivered within 48 hours, irrespective of gestational age or fetal lung maturity. In addition, patients in labor or those with fetuses with a gestational age older than 34 weeks and those with evidence of fetal lung maturity (by amniocentesis) at 33 to 34 weeks also are delivered within 24 hours. Patients at 33 to 34 weeks' gestation with immature lung studies receive steroids to accelerate fetal lung maturity and are delivered 24 hours after the last dose of steroids in the absence of any change in maternal or fetal condition. Patients at 28 to 32 weeks' gestation receive individualized management based on their clinical responses during the observation period. All of these patients receive steroids to accelerate fetal lung maturity. Some demonstrate marked diuresis and improvement in blood pressure during the observation period. If the blood pressure remains below 100 mmHg diastolic (without antihypertensive therapy) after the observation period, magnesium sulfate is discontinued, and the patients are followed-up closely in the ward for patients at high risk until fetal maturity is achieved. During hospitalization, they receive antihypertensive drugs (usually oral nifedipine 40–120 mg/day) to keep their diastolic blood pressure between 90 and 100 mmHg, with daily evaluation of maternal and fetal well-being. Steroids are used as indicated. In general, most of these patients will require delivery within 2 weeks. However, some patients may continue their pregnancies for several weeks. It is important to note that such pregnancies should be managed at tertiary care centers, because the course of pregnancy in such patients is very unpredictable. Fig. 2. Recommended management of severe preeclampsia. HELLP syndrome has been recognized to complicate severe preeclampsia and eclampsia for many years.29 A review of the literature by Sibai and coworkers30 revealed considerable difference concerning the terminology, incidence, cause, diagnosis, and management of the syndrome. The reported incidence ranging from 2% to 12% reflects the difference in diagnostic criteria used to describe this syndrome. Our criteria for the diagnosis of the HELLP syndrome include the laboratory findings, summarized in Table 7. Patients with HELLP syndrome may present with various signs and symptoms, none of which are diagnostic and all of which may be found in patients with severe preeclampsia or eclampsia without HELLP syndrome. Patients usually present remote from term, reporting epigastric or right upper quadrant pain (up to 62%); some will have nausea or vomiting (50%), and others have nonspecific viral syndrome-like symptoms. Most patients (90%) report a history of malaise for the few days preceding their presentation. Patients usually demonstrated significant weight gain with generalized edema.29 It is important to appreciate that severe hypertension (systolic blood pressure, 160 mmHg; diastolic blood pressure, 110 mmHg) is not a constant finding in HELLP syndrome. Sixty-six percent of the patients had a diastolic blood pressure 110 mmHg, whereas 14.5% had a diastolic blood pressure of less than 90 mmHg. Hemolysis, defined as the presence of microangiopathic hemolytic anemia, is the hallmark of the HELLP syndrome. Microangiopathic hemolytic anemia is thought to result from the passage of red blood cells through small vessels with damaged intima and fibrin deposition. It is not specific to HELLP syndrome and is also found in association with thrombotic thrombocytopenic purpura, hemolytic uremic syndrome, eclampsia, and carcinomatosis. The hepatic lesion associated with HELLP syndrome is periportal or focal parenchymal necrosis, in which large hyaline deposits of fibrin-like material can be seen in the sinusoids.31 These findings may be responsible for the elevated liver enzymes and the right upper quadrant pain and tenderness seen in patients with this syndrome. In certain cases, the cellular necrosis and scattered hemorrhage may collapse to form intrahepatic hemorrhage and subcapsular hematoma. Bone marrow studies in patients with the HELLP syndrome show increased megakaryocytes, a feature that is compatible with either increased platelet consumption or destruction. A review of the literature highlights the confusion surrounding the management of this syndrome. Some authors consider its presence to be an indication for immediate delivery by cesarean section, whereas others recommend a more conservative approach to prolong pregnancy in cases of fetal immaturity.32,33,34,35 Most of the therapeutic modalities described in the literature to treat or reverse HELLP syndrome are similar to those used in the management of severe preeclampsia remote from term. The described conservative management techniques were often associated with the use of inappropriate invasive procedures (various biopsies) and medical and surgical treatments. These confounding variables make it difficult to evaluate any treatment modality proposed for this syndrome. Occasionally, some patients without the “true HELLP” syndrome may demonstrate antepartum reversal of hematologic abnormalities. However, most of these patients demonstrate deterioration in either maternal or fetal condition within 1 to 10 days after conservative management. Hence, it is doubtful that such a limited pregnancy prolongation will result in improved perinatal outcome especially when maternal and fetal risks are substantial. Patients with HELLP syndrome who are remote from term should be referred to a tertiary care center and initial management should be as for any patient with severe preeclampsia. The first priority is to assess and stabilize maternal condition and should include correction of coagulopathy if disseminated intravascular coagulopathy is present; antiseizure prophylaxis with magnesium sulfate (even if hypertension is not severe); treatment of severe hypertension with antihypertensive medications; transfer to a tertiary care center if appropriate; and computed tomography or ultrasound of the abdomen (if subcapsular hematoma of the liver is suspected). The next step is to evaluate fetal well-being using the nonstress test or biophysical profile. And finally, a determination about delivery needs to be made. High-dose corticosteroids (dexamethasone 10 mg every 12 hours) have shown transient benefit. Some studies36,37,38 have shown that high-dose corticosteroids may result in improved platelet counts and liver enzyme abnormalities. This improvement in maternal status before delivery results in higher rates of epidural use. If the syndrome develops at or beyond 34 weeks' gestation, or if there is evidence of fetal lung maturity or fetal or maternal jeopardy before that time, then delivery is the definitive therapy. Without laboratory evidence of disseminated intravascular coagulopathy and absent fetal lung maturity, the patient can be administered the doses of steroids to accelerate fetal lung maturity and then be delivered 48 hours later. However, maternal and fetal conditions should be assessed continuously during this period. Platelet transfusions are indicated either before or after delivery if the platelet count is less than 20,000/mm3. Correction of thrombocytopenia is particularly important before cesarean section. However, repeated platelet transfusions are not necessary because consumption occurs rapidly and the effect is transient. Our policy is to administer 6 to 10 units of platelets in all patients with a platelet count less than 50,000 mm3 before intubating the patient for cesarean section. Generalized oozing from the operative site is very common. To minimize the risk of hematoma formation, the bladder flap should be left open and a subfascial drain should be used for 24 to 48 hours. The wound may be left open from the level of the fascia or a subcutaneous drain may be placed and the skin closed. All wounds that are left open can be successfully closed within 72 hours. Failure to adhere to these recommendations may result in approximately 20% incidence of hematoma formation. HELLP syndrome may also develop in the postpartum period. Sibai and associates39 noted in a review of 442 cases with HELLP syndrome, 30% had only postpartum manifestation. In the postpartum group, the time of onset of the manifestations ranged from a few hours to 6 days, with most developing within 48 hours postpartum. Further, 80% had evidence of preeclampsia before delivery. However, 20% had no such evidence either antepartum or intrapartum. Patients in this group are at increased risk for the development of pulmonary edema and acute renal failure.41 Management is similar to the antepartum patient with HELLP syndrome, including the need for antiseizure prophylaxis. Hypertension control may be more aggressive, however, because there is no longer concern about compromising the uteroplacental circulation in the postpartum patient. The differential diagnosis in these cases should include thrombotic thrombocytopenic purpura, hemolytic uremic syndrome, and exacerbation of systemic lupus. Patients with delayed resolution of HELLP syndrome (including persistent severe thrombocytopenia) represent a management dilemma. Exchange plasmapheresis with fresh-frozen plasma has been advocated as a treatment by some authors.42,43 Because most of these patients will have spontaneous resolution of their disease, however, early initiation of plasmapheresis may result in unnecessary treatment. Ultimately, the question remains how many patients would spontaneously improve without benefit of plasmapheresis. Another treatment for delayed resolution is a dexamethasone taper (10 mg, 10 mg, 5 mg, 5 mg every 12 hours). Two studies44,45 have shown that patients with HELLP who were treated with this regimen recovered faster, had less morbidity, and less need for other interventions. The goals of management of women with gestational hypertension–preeclampsia are early detection of fetal heart rate abnormalities, early detection of progression from mild to severe disease, and prevention of maternal complications. Pregnancies complicated by preeclampsia, particularly those with severe disease and/or fetal growth restriction, are at risk for reduced fetal reserve and abruptio placentae. Therefore, all women with preeclampsia should receive continuous monitoring of fetal heart rate and uterine activity, with special attention to hyperstimulation and development of vaginal bleeding during labor. The presence of uterine irritability and/or recurrent variable or late decelerations may be the first sign of abruptio placentae in these women. Some cases of mild hypertension–preeclampsia will progress to severe disease as a result of changes in cardiac output and stress hormones during labor. Therefore, all women with gestational hypertension–preeclampsia should have blood pressure recordings every hour, and they need to be questioned about the new onset of symptoms suggestive of severe disease. Those with severe hypertension and/or symptoms should be managed as severe preeclampsia. The use of either epidural, spinal, or combined techniques or regional anesthesia is considered by most obstetric anesthesiologists to be the method of choice during cesarean delivery. In women with severe preeclampsia, general anesthesia increases the risk of aspiration, failed intubation caused by airway edema, and is associated with marked increases in systemic and cerebral pressures during intubation and extubation.1 Women with airway or laryngeal edema may require awake intubation under fiber optic observation with the availability of immediate tracheostomy. Changes in systemic and cerebral pressures may be attenuated by pretreatment with labetalol or nitroglycerine injections. It is important to emphasize that regional anesthesia is contraindicated in the presence of coagulopathy or severe thrombocytopenia (platelet count <50,000/mm3). There are two randomized placebo-controlled trials evaluating the efficacy and safety of magnesium sulfate in women with mild preeclampsia.51,52 One of these trials included 135 women30 and the other included only 222 women.52 There were no instances of eclampsia in either group in both of these trials. In addition, the findings of both studies revealed that magnesium sulfate does not affect the duration of labor and it does not affect the rate of cesarean delivery. However, neither of these studies had adequate sample size to answer the efficacy of magnesium sulfate to prevent convulsions.51,52 Therefore, the benefit of magnesium sulfate in women with mild preeclampsia remains unclear. A randomized trial to answer this question is urgently needed. Our policy is to administer IV magnesium sulfate during labor and postpartum for all women with severe preeclampsia. We do not use this therapy in women with mild gestational hypertension or preeclampsia in the absence of symptoms. In women having elective cesarean delivery, magnesium sulfate is administered at least 2 hours before the procedure and continued during surgery and for at least 12 hours postpartum. The objective of treating acute severe hypertension is to prevent potential cerebrovascular and cardiovascular complications such as encephalopathy, hemorrhage, and congestive heart failure.1 For ethical reasons, there are no randomized trials to determine the level of hypertension to treat to prevent these complications. Antihypertensive therapy is recommended by some for sustained systolic blood pressure values of 180 mmHg or higher, and for sustained diastolic values of 110 mmHg or higher. Some experts recommend treating systolic levels of 160 mmHg or higher, others recommend treating diastolic levels of 105 mmHg or higher, whereas others use a mean arterial blood pressure of 130 mmHg or higher.1,4 The definition of sustained hypertension is not clear and ranges from 30 minutes to 2 hours. The most commonly used and advocated agent for the treatment of severe hypertension in pregnancy is IV hydralazine administered as bolus injections of 5 to 10 mg every 15 to 20 minutes for a maximum dose of 30 mg. Recently, several drugs have been compared with hydralazine in small randomized trials. The results of these trials were the subject of a recent systemic review that suggested that IV labetalol or oral nifedipine are as effective and have fewer side effects than IV hydralazine.53 The recommended dose of labetalol is 20 to 40mg IV every 10 to 15 minutes for a maximum of 220 mg, and the dose of nifedipine is 10 to 20 mg orally every 30 minutes for a maximum dose of 50 mg.1 We generally use sustained blood pressure values of 170 mmHg or more systolic or 110 mmHg or more diastolic to initiate therapy intrapartum. For women with thrombocytopenia and those in the postpartum period, we use systolic values of 160 mmHg or more or diastolic of105 mmHg or more. Our first line agent is IV labetalol. If maximum doses are ineffective, oral nifedipine is added. There are no randomized trials comparing the optimal method of delivery in women with gestational hypertension–preeclampsia. A plan for vaginal delivery should be attempted in all women with mild disease and in most women with severe disease, particularly those beyond 30 weeks' gestation.1 The decision to perform cesarean delivery should be based on fetal gestational age, fetal condition, presence of labor, and cervical Bishop score. In general, the presence of severe preeclampsia is not an indication for cesarean delivery. Our policy is to recommend elective cesarean delivery for all women with severe preeclampsia at less than 30 weeks' gestation who are not in labor and whose Bishop score is less than 5. In addition, we recommend elective cesarean delivery to those with severe preeclampsia plus fetal growth restriction if the gestational age is less than 32 weeks in presence of unfavorable cervical Bishop score. During the immediate postpartum period, women with preeclampsia should receive close monitoring of blood pressure and symptoms consistent with severe disease and accurate measurements of fluid intake and urinary output. These women usually receive large amounts of IV fluids during labor as a result of dehydration before the administration of epidural analgesia, and IV fluids should be administered during the administration of oxytocin and magnesium sulfate in labor and postpartum. In addition, during the postpartum period there is mobilization of extracellular fluid, leading to increased intravascular volume. As a result, women with severe preeclampsia, particularly those with abnormal renal function, those with capillary leak, and those with early onset are at increased risk for pulmonary edema and exacerbation of severe hypertension postpartum. These women should receive frequent evaluation of the amount of IV fluids, oral intake, blood products, and urine output, as well as monitoring by pulse oximetry and pulmonary auscultation. In general, in most women with gestational hypertension, the blood pressure becomes normotensive during the first week postpartum.54 In contrast, in women with preeclampsia, the hypertension takes a longer time to resolve.54 In addition, in some of the women with preeclampsia, there is an initial decrease in blood pressure immediately postpartum, followed by development of hypertension again between days 3 and 6.55 Our policy is to use antihypertensive drugs if the systolic blood pressure is at least 155 mmHg and/or if the diastolic is at least 105 mmHg. Our drug of choice is oral nifedipine starting at 10 mg every 6 hours or nifedipine long-acting 10 mg twice daily to keep blood pressure below that level.56 If the blood pressure is well-controlled and there is absent maternal symptoms, the woman is then discharged home with instructions for daily blood pressure measurements by a home-visiting nurse for the first week postpartum or longer as necessary. Antihypertensive medications are discontinued if the pressure remains below the hypertensive levels for at least 48 hours. The basic principles of management of eclampsia involve the following measures: (1) maternal support of vital functions; (2) control of convulsions and prevention of recurrent convulsions; (3) correction of maternal hypoxemia and/or acidemia; (4) control of severe hypertension to a safe range; and (5) initiate process of delivery. Eclamptic convulsions constitute a life-threatening emergency. During the eclamptic seizure, measures are taken to prevent maternal injury, such as insertion of a padded tongue blade between the teeth and to safeguard against potential maternal morbidity after the convulsion. The most urgent part of the therapy is to assess airway patency, to ensure maternal oxygenation and to minimize the risk of aspiration. Most eclamptic convulsions resolve in 60 to 90 seconds. Oxygen should be administered during the convulsive episode to improve maternal oxygen concentration and to increase oxygen delivery to the fetus. Parenteral magnesium sulfate is the drug of choice to control and prevent eclamptic convulsions. The drug does not cause any significant maternal–neonatal central nervous system depression when used properly. During its administration, the mother is awake and alert with intact laryngeal reflexes, which helps to protect against aspiration. Fetal magnesium levels tend to equilibrate with maternal levels after prolonged administration; however, neural muscular depression in the newborn is rarely seen with proper use of the drug. In contrast, the use of other anticonvulsants, such as narcotics, sedatives, tranquilizers, and barbiturates, can cause significant maternal neonatal central nervous system and respiratory depression. The use of these agents may decrease the laryngeal reflexes and allow aspiration. There are numerous reports that describe the use of various methods to prevent or reduce the incidence of gestational hypertension preeclampsia (Table 8). There is no evidence that prenatal care reduces the incidence of mild disease, but there is definite evidence that it reduces the incidence of severe disease and thus improves perinatal outcome. In addition, there is no evidence that bedrest in the left lateral position reduces the incidence of mild hypertension. Moreover, in patients with mild hypertension, it remains uncertain whether the practice of complete bedrest at home or the use of sedation will prevent progression to severe disease. Many articles have been published regarding the risks and benefits of using either low-salt diet or diuretics in pregnancy. The only randomized trial of low-salt diet in pregnancy did not demonstrate any reduction in the incidence of gestational hypertension in the study group.66 In addition, a meta-analysis of nine randomized trials comprising more than 7000 subjects regarding the use of diuretics in pregnancy revealed a decrease in the incidence of edema and hypertension but not in the incidence of preeclampsia.67 Thus, there is no clear evidence to suggest that prophylactic use of diuretics reduces the incidence of preeclampsia. The relationship between dietary magnesium deficiency and hypertension has been the subject of several experimental and observational studies. Dietary magnesium deficiency during pregnancy has been implicated in the pathogenesis of preeclampsia, fetal growth retardation, and preterm delivery.69,70,71 In a retrospective study, Conradt and coworkers70 compared the pregnancy outcome in 4023 patients at low risk for preeclampsia and fetal growth retardation. The women at risk were treated with isoxsuprine in combination with various doses of magnesium aspartate hydrochloride. The authors reported significantly lower incidences of preeclampsia and fetal growth retardation in the treated group. They concluded that routine magnesium supplementation during pregnancy prevents preeclampsia and fetal growth retardation. However, two subsequent double-blind placebo-controlled trials71,72 showed no reduction in the incidence of preeclampsia in the magnesium-supplemented group. Several studies have suggested an association between zinc deficiency and pregnancy-induced hypertension. Several studies reported reduced plasma and leukocyte zinc levels, as well as reduced placental zinc levels in patients with pregnancy-induced hypertension compared with those in normotensive pregnancies.73 To date, there are two randomized trials evaluating the benefits of zinc supplementation during pregnancy. Hunt and associates74 reported a reduced incidence of pregnancy-induced hypertension among Mexican-American women who received zinc supplementation. However, Mahomed and colleagues75 found no reduction in incidence of preeclampsia among British women who received such supplementation. These differences may be related to baseline zinc status between the two study populations. Thus, more data are needed to establish any potential benefits from routine zinc supplementation in pregnancy. There is a very recent trial that demonstrated reduced rates of preeclampsia with vitamins C and E in women identified as at risk by means of abnormal uterine Doppler studies90 (increased resistance index and presence of notch). However, there was no improvement in perinatal outcome in the vitamin supplemental group. Hypertensive disorders are the most common medical complication of pregnancy. The spectrum of disease ranges from mildly elevated blood pressure with minimal clinical significance to severe hypertension and multiorgan dysfunction. The incidence of disease is dependent on many different demographic parameters, including maternal age, race, and associated underlying medical conditions. Understanding the disease process and the impact of hypertensive disorders on pregnancy is of the utmost importance, because these disorders remain a major cause of maternal and perinatal morbidity and mortality worldwide.